I was reading WUWT today, there's an interesting article about new research on Antarctic sea ice, which the WUWT-ers are finding difficult to get their head around. Anthony didn't go to any trouble as usual (archived here), he just copied and pasted the press release. If you want to keep up with science news, you'd do better by reading ScienceDaily.com than WUWT. So here's a bit more about it, plus the denialati reaction. First the research itself. There's a press release at ScienceDaily.com about how scientists have produced detailed, high-resolution 3-D maps of Antarctic sea ice. That means ice thickness as well as showing how ice behaves in winter (there's not much sea ice in summer around Antarctica). Here's a map highlighting the areas that the scientists wrote up about in the paper in Nature Geoscience. As always, click to enlarge. Someone invented a robot, or Autonomous Underwater Vehicle (AUV) and called it SeaBED - the name is descriptive if not cute. The robot is yellow, which brings to mind the Beatles. 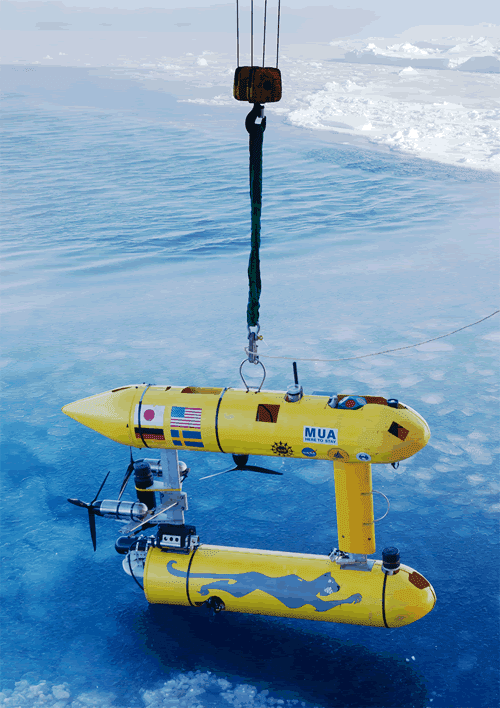 Here's a photo of one of the robots, Jaguar, being recovered after a trip under the ice. Here's a video from the British Antarctic Survey YouTube channel, presented by an American :) It's Dr Ted Maksym of the Woods Hole Oceanographic Institution, which is one of the collaborators I mentioned. It's short and informative and worth watching. For the videos here, you can click in the bottom right hand corner if you want to view them full screen or on YouTube. Did you know that sea ice covers 7% of the surface of the ocean? That was a surprise to me. I'd no idea it was that much. The robot, SeaBED, is about 2 metres long and weighs nearly 200 kilograms. It has a twin-hull design for enhanced stability. And the video shots it takes are brilliant, aren't they. I'm assuming that the cameras that took some of these shots are on a robot - but maybe not, I don't know. "Putting an AUV together to map the underside of sea ice is challenging from a software, navigation and acoustic communications standpoint," says Hanumant Singh, an engineering scientist at the Woods Hole Oceanographic Institution (WHOI) whose lab designed, built and operated the AUV. "SeaBED's maneuverability and stability made it ideal for this application where we were doing detailed floe-scale mapping and deploying, as well as recovering in close-packed ice conditions. It would have been tough to do many of the missions we did, especially under the conditions we encountered, with some of the larger vehicles." "The full 3-D topography of the underside of the ice provides a richness of new information about the structure of sea ice and the processes that created it. This is key to advancing our models particularly in showing the differences between Arctic and Antarctic sea ice." The data from SeaBED, combined with airborne measurements of sea-ice surface elevation, ice coring surveys, and satellite observations, vastly improves scientists' estimates of ice thickness and total sea ice volume. Co-author Dr Jeremy Wilkinson from British Antarctic Survey (BAS) says, "The AUV missions have given us a real insight into the nature of Antarctic sea ice -- like looking through a microscope. We can now measure ice in far greater detail and were excited to measure ice up to 17 metres thick." The team deployed AUVs as part of two Antarctic cruises (IceBell and SIPEX-2) in 2010 and 2012 in the austral spring. First on the British Antarctic Survey's RRS James Clark Ross and the second on the Australian icebreaker the RSV Aurora Australis. 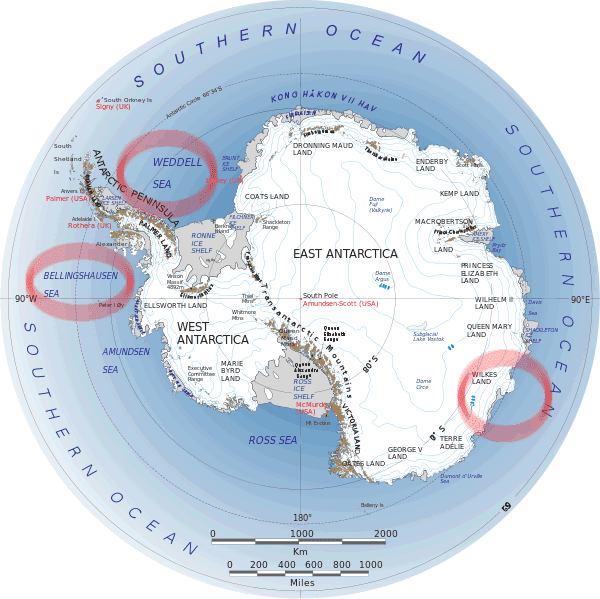 Three locations around the Antarctic Peninsula were mapped -- the Weddell, Bellinghausen and Wilkes Land sectors covering an area of 500,000 square metres, the size of 100 football pitches. "What this effort does is show that observations from AUVs under the ice are possible and there is a very rich data set that you can get from them," says Ted Maksym, a WHOI scientist and co-author of the paper. "This work is an important step toward making the kinds of routine measurements we need in order to really monitor and understand what's happening with the ice and the large scale changes that are occurring." Here we present three-dimensional (3D) floe-scale maps of sea-ice draft for ten floes, compiled from two springtime expeditions by an autonomous underwater vehicle to the near-coastal regions of the Weddell, Bellingshausen, and Wilkes Land sectors of Antarctica. Mean drafts range from 1.4 to 5.5 m, with maxima up to 16 m. We also find that, on average, 76% of the ice volume is deformed ice. Our surveys indicate that the floes are much thicker and more deformed than reported by most drilling and ship-based measurements of Antarctic sea ice. We suggest that thick ice in the near-coastal and interior pack may be under-represented in existing in situ assessments of Antarctic sea ice and hence, on average, Antarctic sea ice may be thicker than previously thought. What they have found, by my reading, is that the ice moves about and gets jumbled up a lot more than one would have thought, and that the ice near the coast and in the interior of the ice pack can get really, really thick. Looking at the video above, where Ted Maksym showed one of the ridges formed in the ice pack, I can imagine the ice getting all pushed together and getting squeezed upwards and downwards. It's going to become much more important over the next few years to understand what's happening in Antarctica. For one thing, that's where a lot of the extra water driving sea level rise is going to come from. And it probably won't come gradually, but in sudden biggish jumps over a decade or less, with intervening years not so much. The more prepared we can be the better. If scientists can figure out and give us a bit of warning of those "sudden jump" decades, the better we'll be able to deal with the consequences. You'd have thought anyone would be fascinated by this project, even envious of the researchers who've been able to take part in this adventure into dangerous and rarely entered territory. But not so with a lot of them. Remember we're talking about people who have a very strong antipathy toward the creation of any new knowledge, but particularly to knowledge about the earth system. The scientific illiterati. joe crew seems to think that some people will dispute the findings. Probably too used to that sort of thing happening at WUWT. Plan on the awarmists saying this isn’t the type of ice they are concerned about but some other type of Antarctic ice is more indicative of global warming. Maybe they should drink more of that Kool Aid using the ice in the fridge, you know, the kind produced by very reliable, coal-fired electricity. Bill doesn't follow mainstream media, the research has been promoted widely, such as BBC News, the UK Guardian, and CBS News, and Reuters, and CNet, and ITV News and TVNZ (New Zealand) and even the Utah People's Post :). If this was the other way around and warmists had found the ice to be thinner than thought it would be hyped to the heavens. If this were to be hyped in the same way, one would simply say the ice had “jumped” in an “unprecedented” manner from a few feet to 17 meters (say 45 feet) rather than saying these were new measurements and we did not really know how thick it was until now and that the error bars were different between the older and newer measurements. Bill to his credit decided to amend his comment, after discovering that in summer most of the Antarctic sea ice melts away. After reading posts below, I will amend my statement. If the mean is still in same range, there is nothing to be hyped anyway. And if it melts out each year, it does not matter. If there was 17 meter ice that did not melt and was then 18 meters the next year, that would matter. Didn’t we just read about the “thinness” of Antarctic ice, and the explanation that warmer water due to colder air was melting the Antarctic ice from below? I can’t keep track of what is or isn’t current. I don’t doubt the scientists’ honest intent. But the contradictions keep telling me that EVERYTHING about global warming is regional or local, not global. The machinations of mathematics and models, which induce and smear observations from a spot to an area appear to create a global situation for public policy and personal importance reasons, when a regional situation is what is true. Computational, ideological and emotional reality, not representational reality, as I choose to describe CAGW. RJ is a run of the mill denier who won't accept climate science even after all these years. Just another nutter typical of WUWT. “This work is an important step toward making the kinds of routine measurements we need in order to really monitor and understand what’s happening with the ice and the large scale changes that are occurring. I wonder what “large scale changes” they think are occurring? This is a baseline measurement which might help them understand what is there now, but they have no data on any “changes”. It is a massive leap of faith in CAGW to assume “changes that are occurring”. This was a rare comment from the denialati. Oldseadog isn't always opposed to new knowledge, unlike most at WUWT. Aw, come on, this seems to me to be new information and so long as no-one “improves” or “adjusts” the data, new information can only be a “good thing”. What the warmists do with the information is a different thing altogether. That shows they start with preconceptions – a bias. In real science, surely the aim is to advance understanding. Period. Golly gosh. What scientist would be so presumptuous or even hope for such a thing. A lot of the rest look to be just the normal dumb one-liners of protest about something or other, which may or may not be related to the article in question. I haven't bothered wading through them all. WUWT is nothing more than a shouting board for deniers to let off steam. There are no amazing insights. Nothing to learn, except if you're a shrink perhaps. You can read more here if you're so inclined. Anthony's lede killed me: "From the British Antarctic Survey comes this press release which really isn’t a surprise to climate skeptics." One would think such oracles would beat those ignorant warmists to the punch with leading research more often. Climate septics are never surprised because they have recurring amnesia that allows them to forget all the things they have got wrong. For example, New York floods: which were 'alarmist' predictions until they happened, when they became the inevitable consequence of weather and therefore 'no surprise' to the septics. So I asked a guy on WUWT to show me a non-IPCC approved GCM which is more skillful over out-of sample data. Told him I'd be all eyes. He said my phrasing was "odd" or some such since every "skeptical" model does better hindcasts than the CMIP5 ensemble. It's like watching New York roaches scrambling for the floorboards when you flick on the kitchen light for a 2 am snack.